A new week and a new podcast! And this time, I'm more on top of posting for it than last week. Which was considerably easy, since I was a few days behind last week. 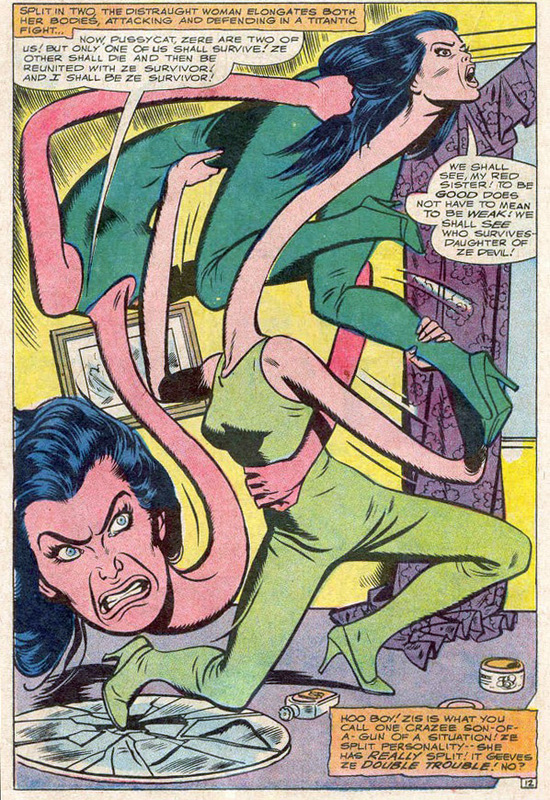 Episode 69: Well We Wouldn't Want Weirdness To Come Into It, Would We?Horrible mutants! Horrible accents! 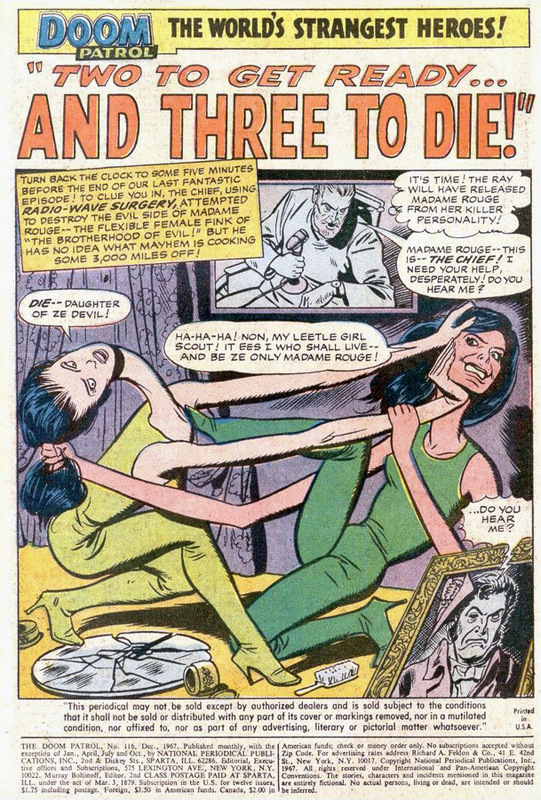 Horrible Comic Book Science! Horrible Perve-O-Meters! Horrible reinforcements! Horrible nazi gorillas! Let's get horrible! No, wait, let's get PATROLLING!! Doomsplaining - 17:53 - this week we head back to the 1960s, for issues 115 and 116 of volume 1, by Arnold Drake and Bruno Premiani! Mailbag O Doom - 49:19 - We read your responses to the question, "Who's your favourite character with a fin?" Look out over there! Ha! See what I did there? What could have caused these monstrosities to be? 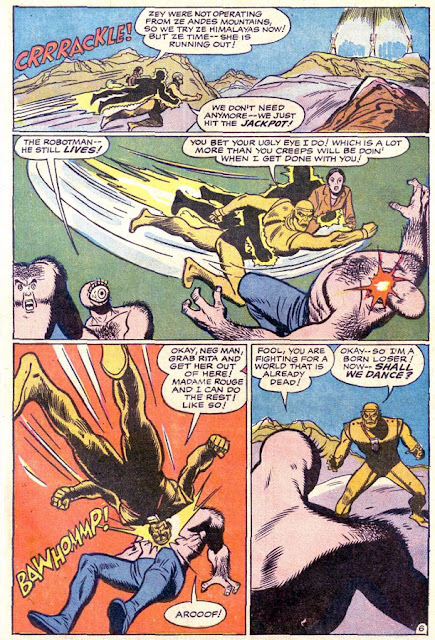 Top panel: Meet the Mutant Masters - Ur, Ir, and Ar! Middle: Chief schemes for love. Doom Patrol #115 introduces Ar, Ir and Ur (yeah, that's fun with an Australian accent!). 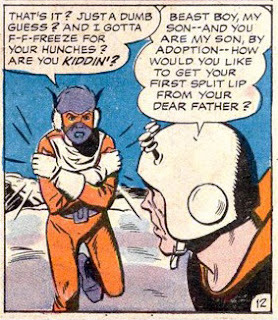 Does it get any more Silver Age-y than that? 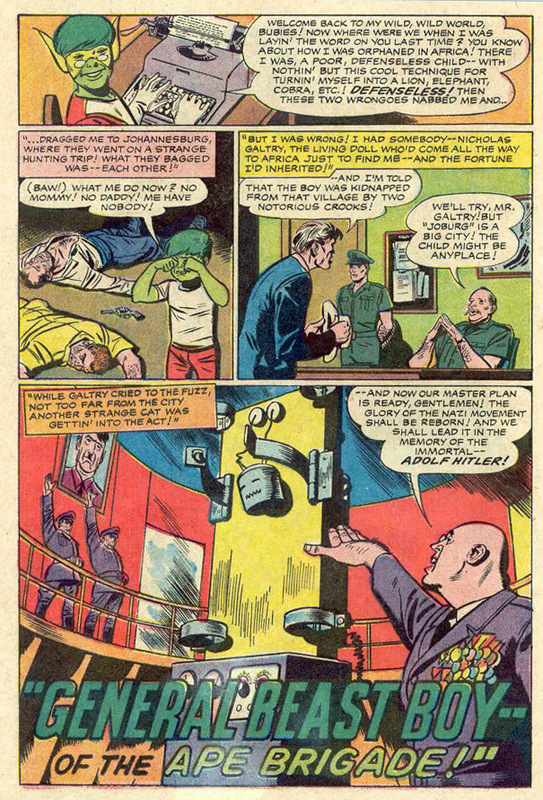 For ease of use, Paul broke the gang down to even more Silver Age-y monikers, dubbing Ar as Torso-Face, Ir as Eye-Hands, and Ur becomes Eye-Face. 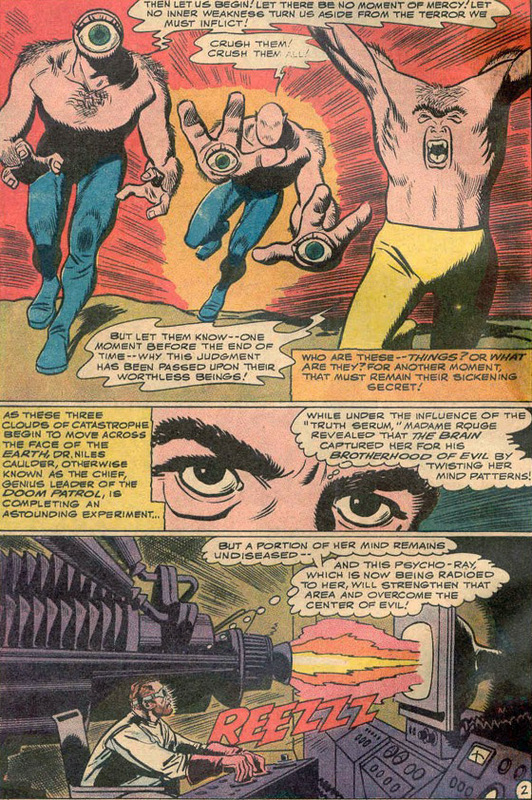 As seen in the image above (which is Page 2 in its entirety) Drake and Premiani waste no time in shifting scenes in what would, undoubtedly, be a five-issue series in today's market. Before we shift along to other images from the issue, is it just me or does Ar remind anyone else of Strong Mad? 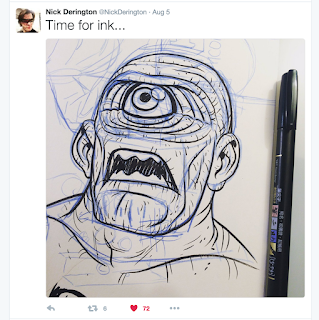 Here's Nick Derington's drawing from Twitter the gents reference. Wow. I just dropped a Tweet in and made it seem like "news," I should be expecting my journalism degree in the mail any day now, right? 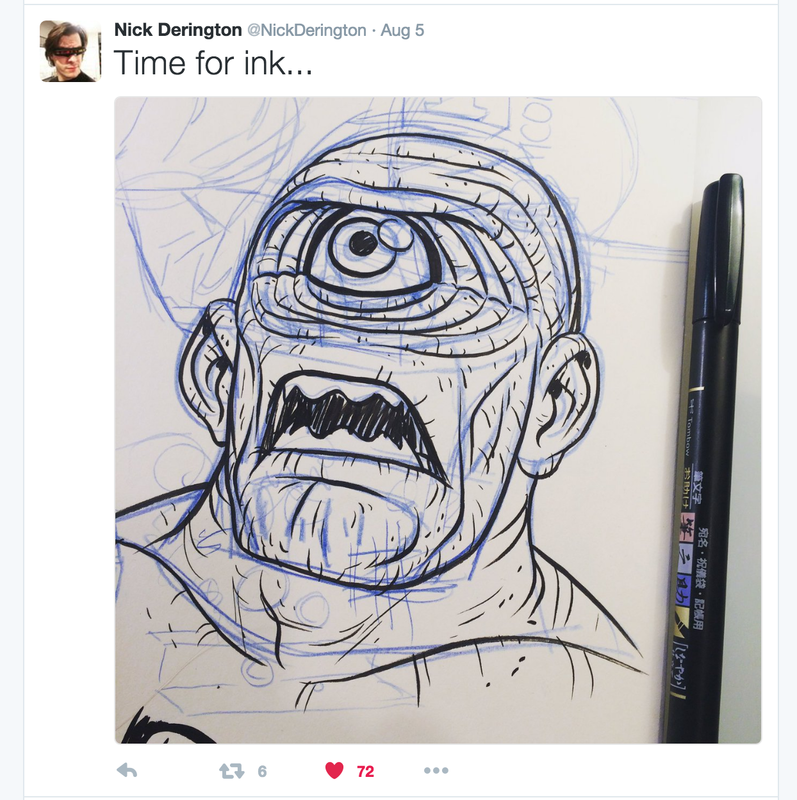 There's some more from Nick Derington towards the end of this post, as well as in other posts of late, and, well, in less than two weeks, we'll all have even more from Derington. Now, on to the other bits from the issue. As you can see in the image above, Chief continues to push the limits of his mental pervishness (a word, trust me) in trying to sway Madame Rouge, but the Brotherhood is also trying to bring her back. Madame Rouge has a SPLITTING headache! The end result is quite absurd, even for Arnold Drake's Doom Patrol. Absurd, yes, but so much wacky fun. Madame Rouge! Get a hold of yourself! Who ordered the Rouge on Rouge platter? I'm sorry, but we're all out. How about a nice, crazy splash page instead? Gotta love those French accents. So accurate. So true. 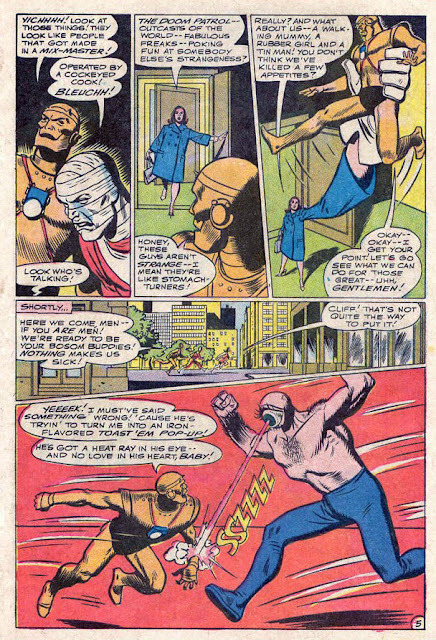 And what's an issue of Doom Patrol without Robotman getting damaged? Farr & Away Rita's most impactful scene in the issue and Cliff's contribution to your drinking problem. 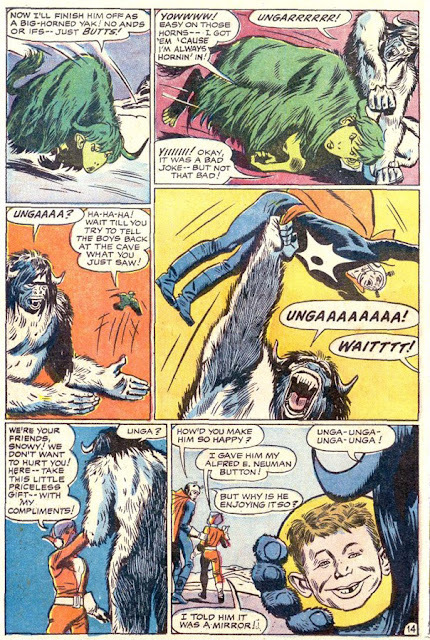 As the guys said, this is the final chapter for the early adventures of Beast Boy. Still sporting his Trump hairstyle, and the annoying babytalk, Beast Boy makes it easy to dislike him. Not as much as say, Nazis, which are included in this issue for sake of elevating Beast Boy to being slightly less annoying. That said, this issue HAD to be a hit. As legend has it, Julius Schwarz encouraged the use of gorillas to boost comic book sales. And Nazis were the ultimate evil, so this made sense. In a Silver Age-y comic book marketing (separate study, but closely related to comic book science) way. And it really isn't a terrible installment. 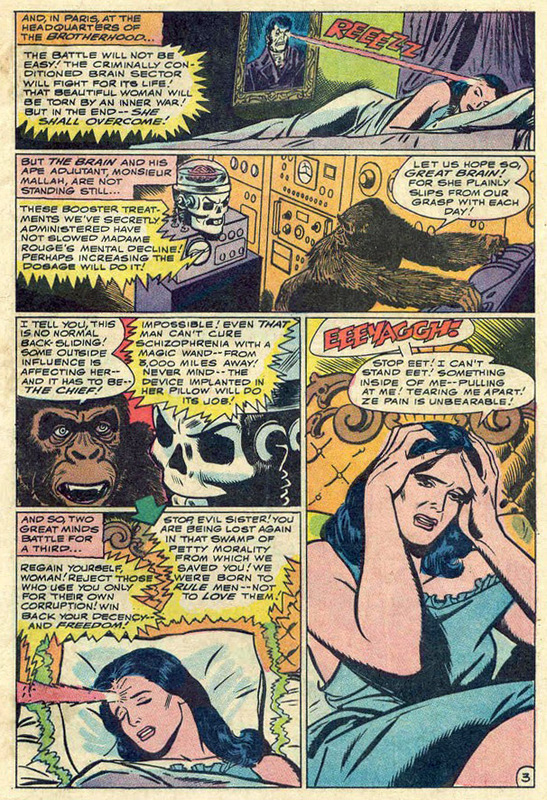 As Beast Boy stories chewing up real estate in a Doom Patrol comic go. Because gorillas. Hitler and Beast Boy. Only Mento could make this page any more hate-filled. 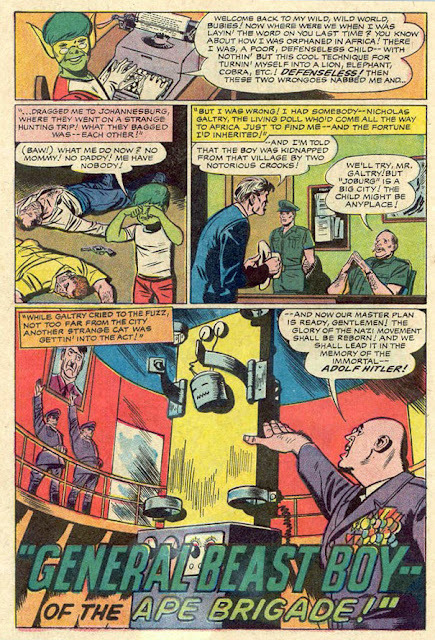 For some odd reason, Beast Boy has me thinking of Jib Janeen, the Jupiter Spy from The Thrilling Adventure Hour. Maybe it's his use of "Bubies" where Janeen might say "buddies," maybe it's the Trump hair. Maybe it's just the fact that both are laughably annoying. I don't know. I liked Gar Logan as Changeling when I met him in the Wolfman-Pérez Titans books so many years ago, but I'm not so sure I would have been enthusiastic to see him return had I read these adventures first. And now the stuff from #116. In case you missed the Perve-O-Meter induced catfight from #115. Rita's fine wtih Rouge's assist, and quite confident in her place on the team. Farr & Away: Rita's confidence grows with her. Never count Robotman out, not out of a fight, and not out of a dance. Taking a hint from Star-Lord, Cliff challenges Eye-Hands to a dance off. There's a point in this issue where Beast Boy and Mento are alone in the Himalayas. Unprepared for the cold, and left to die. Except Arnold Drake hates us all. I'm not sure where this one lands on the "Take a Drink" game. Maybe a shot? Or a kegstand? And now, a very special panel. Llamas? No. Madame Rouge fighting herself again? No. Except this one page had SOOOOOOO much going on for it - the Alfred E. Neuman button, the Trump-haired yak, and the junk punch! Hard to believe there were any other pages in this issue! #116 was definitely more of a mixed bag of weirdness than #115, and I could spend much more time on either one, panel by panel. 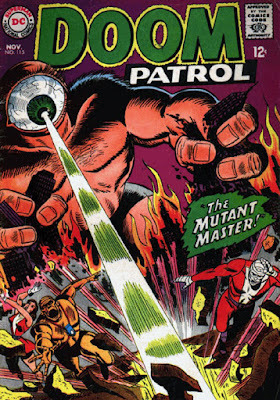 Premiani was at the peak of his craft here, and us Doom Patrollers are lucky to have had him around. But enough of the past. It distracts from the now. Let's talk a bit about the now. And, if you didn't see it, Nick Derington shared a photo of his bootleg Danny the World action figure. The pawns of WilFreD mentioned the Bleeding Cool review of Doom Patrol#1. Here's the very, very, very spoiler-filled link. 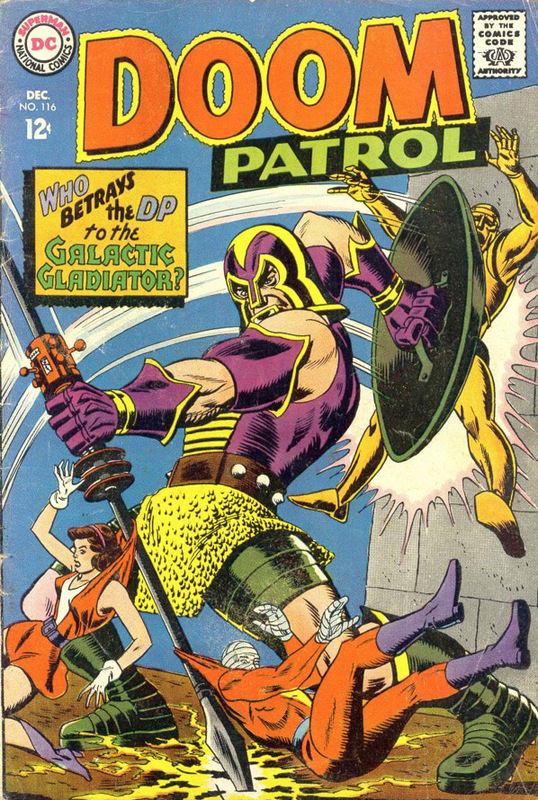 Since we're linking right now, here's the link to Amazon's offering of the Doom Patrol in the Silver Age that Paul mentioned. 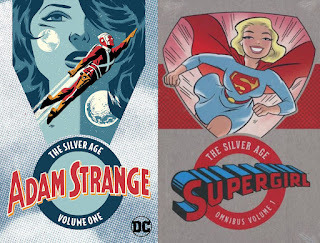 A few of these ". . .in the Silver Age" books have keen Darwyn Cooke covers, like the Supergirl one (Hi, Anj! Is this book any good?) below or the Adam Strange (for all you folks who nominated Strange as your favorite finned character) cover by Michael Cho. So there you have it my bubies! Another post shadowing the awesome audio of the amicable Australians. Before you click away, however, take a second or forty-eight and sound off on the Question of the Week. WilFred begs of you: Who is your favourite fictional foursome? This is an exceptional bit of work to augment our show. 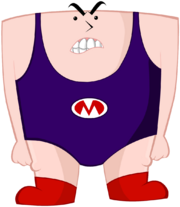 Well done Doug, you are a learned Patrologist and the true Ambassador of Doom!